I'm not even gonna go there. Maryse says Dufus is a total bear in the morning. It was the very next morning that Judy decided "no more tequila." Thank gawd last night was not a 3 dog night. Sheila felt that the arguments between her and her husband were becoming unbearable. 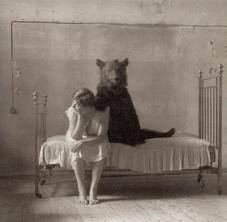 Sheila's family was against the wedding but it was her bear to cross. We can't even talk anymore, all he does is moan and groan, he wont keep his paws off me. All he wants to do is put his "lil boo boo" ib my picnic basket! I wish he would just hibernate.